Pink Floyd were founded by students Syd Barrett on guitar and lead vocals, Nick Mason on drums, Roger Waters on bass and vocals, and Richard Wright on keyboards and vocals. They gained popularity performing in London's underground music scene during the late 1960s, and under Barrett's leadership released two charting singles and a successful debut album, The Piper at the Gates of Dawn (1967). Guitarist and vocalist David Gilmour joined in December 1967; Barrett left in April 1968 due to deteriorating mental health. Waters became the primary lyricist and conceptual leader, devising the concepts behind their albums The Dark Side of the Moon (1973), Wish You Were Here (1975), Animals (1977), The Wall (1979) and The Final Cut (1983). The Dark Side of the Moon and The Wall became two of the best-selling albums of all time. Following creative tensions, Wright left Pink Floyd in 1979, followed by Waters in 1985. Gilmour and Mason continued as Pink Floyd, joined later by Wright. The three produced two more albums—A Momentary Lapse of Reason (1987) and The Division Bell (1994)—and toured through 1994. 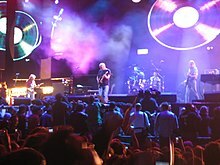 In 2005, after nearly two decades of enmity, Gilmour, Wright, Mason and Waters reunited as part of the global awareness event Live 8; Gilmour and Waters stated they had no further plans to reunite the band. Barrett died in 2006, and Wright in 2008. The last Pink Floyd studio album, The Endless River (2014), was recorded without Waters and based almost entirely on unreleased material from The Division Bell recording sessions. Pink Floyd were inducted into the American Rock and Roll Hall of Fame in 1996 and the UK Music Hall of Fame in 2005. By 2013, they had sold more than 250 million records worldwide. Roger Waters and Nick Mason met while studying architecture at the London Polytechnic at Regent Street. They first played music together in a group formed by Keith Noble and Clive Metcalfe with Noble's sister Sheilagh. Richard Wright, a fellow architecture student,[nb 1] joined later that year, and the group became a sextet, Sigma 6. Waters played lead guitar, Mason drums, and Wright rhythm guitar (since there was rarely an available keyboard). The band performed at private functions and rehearsed in a tearoom in the basement of the Regent Street Polytechnic. They performed songs by the Searchers and material written by their manager and songwriter, fellow student Ken Chapman. By 1966, the group's repertoire consisted mainly of rhythm and blues songs and they had begun to receive paid bookings, including a performance at the Marquee Club in March 1966, where Peter Jenner, a lecturer at the London School of Economics, noticed them. Jenner was impressed by the sonic effects Barrett and Wright created, and with his business partner and friend Andrew King became their manager. The pair had little experience in the music industry and used King's inheritance to set up Blackhill Enterprises, purchasing about £1,000 (equivalent to £18,300 in 2018) worth of new instruments and equipment for the band. [nb 7] It was around this time that Jenner suggested they drop the "Sound" part of their band name, thus becoming the Pink Floyd. Under Jenner and King's guidance, the group became part of London's underground music scene, playing at venues including All Saints Hall and the Marquee. While performing at the Countdown Club, the band had experimented with long instrumental excursions, and they began to expand them with rudimentary but effective light shows, projected by coloured slides and domestic lights. Jenner and King's social connections helped gain the band prominent coverage in the Financial Times and an article in the Sunday Times which stated: "At the launching of the new magazine IT the other night a pop group called the Pink Floyd played throbbing music while a series of bizarre coloured shapes flashed on a huge screen behind them ... apparently very psychedelic." In 1966, the band strengthened their business relationship with Blackhill Enterprises, becoming equal partners with Jenner and King and the band members each holding a one-sixth share. By late 1966, their set included fewer R&B standards and more Barrett originals, many of which would be included on their first album. While they had significantly increased the frequency of their performances, the band were still not widely accepted. Following a performance at a Catholic youth club, the owner refused to pay them, claiming that their performance was not music. When their management filed suit in a small claims court against the owner of the youth organisation, a local magistrate upheld the owner's decision. The band was much better received at the UFO Club in London, where they began to build a fan base. Barrett's performances were enthusiastic, "leaping around ... madness ... improvisation ... [inspired] to get past his limitations and into areas that were ... very interesting. Which none of the others could do", wrote biographer Nicholas Schaffner. In 1967, Pink Floyd began to attract the attention of the music industry. [nb 8] While in negotiations with record companies, IT co-founder and UFO club manager Joe Boyd and Pink Floyd's booking agent Bryan Morrison arranged and funded a recording session at Sound Techniques in West Hampstead. Three days later, Pink Floyd signed with EMI, receiving a £5,000 advance (equivalent to £89,100 in 2018). EMI released the band's first single, "Arnold Layne", with the B-side "Candy and a Currant Bun", on 10 March 1967 on its Columbia label. [nb 9] Both tracks were recorded on 29 January 1967. [nb 10] "Arnold Layne"'s references to cross-dressing led to a ban by several radio stations; however, creative manipulation by the retailers who supplied sales figures to the music business meant that the single peaked in the UK at number 20. Morrison and EMI producer Norman Smith negotiated Pink Floyd's first recording contract, and as part of the deal, the band agreed to record their first album at EMI Studios in London. [nb 11] Mason recalled that the sessions were trouble-free. Smith disagreed, stating that Barrett was unresponsive to his suggestions and constructive criticism. EMI-Columbia released The Piper at the Gates of Dawn in August 1967. The album peaked at number 6, spending 14 weeks on the UK charts. One month later, it was released under the Tower Records label. Pink Floyd continued to draw large crowds at the UFO Club; however, Barrett's mental breakdown was by then causing serious concern. The group initially hoped that his erratic behaviour would be a passing phase, but some were less optimistic, including Jenner and his assistant, June Child, who commented: "I found [Barrett] in the dressing room and he was so ... gone. Roger Waters and I got him on his feet, [and] we got him out to the stage ... The band started to play and Syd just stood there. He had his guitar around his neck and his arms just hanging down". 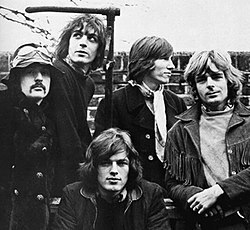 In December 1967, the group added guitarist David Gilmour as the fifth member of Pink Floyd. [nb 15] Gilmour already knew Barrett, having studied with him at Cambridge Tech in the early 1960s. The two had performed at lunchtimes together with guitars and harmonicas, and later hitch-hiked and busked their way around the south of France. In 1965, while a member of Joker's Wild, Gilmour had watched the Tea Set. Morrison's assistant, Steve O'Rourke, set Gilmour up in a room at O'Rourke's house with a salary of £30 per week (equivalent to £500 in 2018), and in January 1968, Blackhill Enterprises announced Gilmour as the band's newest member; the second guitarist and its fifth member, the band intending to continue with Barrett as a nonperforming songwriter. Jenner commented: "The idea was that Dave would ... cover for [Barrett's] eccentricities and when that got to be not workable, Syd was just going to write. Just to try to keep him involved". [nb 16] In an expression of his frustration, Barrett, who was expected to write additional hit singles to follow up "Arnold Layne" and "See Emily Play", instead introduced "Have You Got It Yet?" to the band, intentionally changing the structure on each performance so as to make the song impossible to follow and learn. In a January 1968 photo-shoot of the five-man Pink Floyd, the photographs show Barrett looking detached from the others, staring into the distance. In 1968, Pink Floyd returned to Abbey Road Studios to record their second album, A Saucerful of Secrets. The album included Barrett's final contribution to their discography, "Jugband Blues". Waters began to develop his own songwriting, contributing "Set the Controls for the Heart of the Sun", "Let There Be More Light" and "Corporal Clegg". Wright composed "See-Saw" and "Remember a Day". Norman Smith encouraged them to self-produce their music, and they recorded demos of new material at their houses. With Smith's instruction at Abbey Road, they learned how to use the recording studio to realise their artistic vision. However, Smith remained unconvinced by their music, and when Mason struggled to perform his drum part on "Remember a Day", Smith stepped in as his replacement. Wright recalled Smith's attitude about the sessions, "Norman gave up on the second album ... he was forever saying things like, 'You can't do twenty minutes of this ridiculous noise'". As neither Waters nor Mason could read music, to illustrate the structure of the album's title track, they invented their own system of notation. Gilmour later described their method as looking "like an architectural diagram". Released in June 1968, the album featured a psychedelic cover designed by Storm Thorgerson and Aubrey Powell of Hipgnosis. The first of several Pink Floyd album covers designed by Hipgnosis, it was the second time that EMI permitted one of their groups to contract designers for an album jacket. The release peaked at number 9, spending 11 weeks on the UK chart. Record Mirror gave the album an overall favourable review, but urged listeners to "forget it as background music to a party". John Peel described a live performance of the title track as "like a religious experience", while NME described the song as "long and boring ... [with] little to warrant its monotonous direction". [nb 19] On the day after the album's UK release, Pink Floyd performed at the first ever free concert in Hyde Park. In July 1968, they returned to the US for a second visit. Accompanied by the Soft Machine and the Who, it marked Pink Floyd's first significant tour. In December of that year, they released "Point Me at the Sky"; no more successful than the two singles they had released since "See Emily Play", it would be the band's last until their 1973 release, "Money". In October 1970, Pink Floyd released Atom Heart Mother. [nb 20] An early version premièred in France in January, but disagreements over the mix prompted the hiring of Ron Geesin to work out the sound problems. Geesin worked to improve the score, but with little creative input from the band, production was troublesome. Geesin eventually completed the project with the aid of John Alldis, who was the director of the choir hired to perform on the record. Smith earned an executive producer credit, and the album marked his final official contribution to the band's discography. Gilmour said it was "A neat way of saying that he didn't ... do anything". Waters was critical of Atom Heart Mother, claiming that he would prefer if it were "thrown into the dustbin and never listened to by anyone ever again". Gilmour was equally dismissive of the album and once described it as "a load of rubbish", stating: "I think we were scraping the barrel a bit at that period". Pink Floyd's first number 1 album, Atom Heart Mother was hugely successful in Britain, spending 18 weeks on the UK chart. It premièred at the Bath Festival on 27 June 1970. Pink Floyd toured extensively across America and Europe in 1970. [nb 21] In 1971, Pink Floyd took second place in a reader's poll, in Melody Maker, and for the first time were making a profit. Mason and Wright became fathers and bought homes in London while Gilmour, still single, moved to a 19th-century farm in Essex. Waters installed a home recording studio at his house in Islington in a converted toolshed at the back of his garden. In January 1971, upon their return from touring Atom Heart Mother, Pink Floyd began working on new material. Lacking a central theme, they attempted several unproductive experiments; engineer John Leckie described the sessions as often beginning in the afternoon and ending early the next morning, "during which time nothing would get [accomplished]. There was no record company contact whatsoever, except when their label manager would show up now and again with a couple of bottles of wine and a couple of joints". The band spent long periods working on basic sounds, or a guitar riff. They also spent several days at Air Studios, attempting to create music using a variety of household objects, a project which would be revisited between The Dark Side of the Moon and Wish You Were Here. The iconic artwork for The Dark Side of the Moon was designed by Hipgnosis and George Hardie. Pink Floyd recorded The Dark Side of the Moon between May 1972 and January 1973 with EMI staff engineer Alan Parsons at Abbey Road. The title is an allusion to lunacy rather than astronomy. The band had composed and refined the material while touring the UK, Japan, North America and Europe. Producer Chris Thomas assisted Parsons. Hipgnosis designed the packaging, which included George Hardie's iconic refracting prism design on the cover. Thorgerson's cover features a beam of white light, representing unity, passing through a prism, which represents society. The refracted beam of coloured light symbolises unity diffracted, leaving an absence of unity. Waters is the sole author of the lyrics. Released in March 1973, the LP became an instant chart success in the UK and throughout Western Europe, earning an enthusiastic response from critics. Each member of Pink Floyd except Wright boycotted the press release of The Dark Side of the Moon because a quadraphonic mix had not yet been completed, and they felt presenting the album through a poor-quality stereo PA system was insufficient. Melody Maker's Roy Hollingworth described side one as "utterly confused ... [and] difficult to follow", but praised side two, writing: "The songs, the sounds ... [and] the rhythms were solid ... [the] saxophone hit the air, the band rocked and rolled". Rolling Stone's Loyd Grossman described it as "a fine album with a textural and conceptual richness that not only invites, but demands involvement." Throughout March 1973, The Dark Side of the Moon featured as part of Pink Floyd's US tour. The album is one of the most commercially successful rock albums of all time; a US number 1, it remained on the Billboard chart for more than fourteen years, selling more than 45 million copies worldwide. In Britain, the album peaked at number 2, spending 364 weeks on the UK chart. Dark Side is the world's third best-selling album, and the twenty-first best-selling album of all time in the US. The success of the album brought enormous wealth to the members of Pink Floyd. Waters and Wright bought large country houses while Mason became a collector of expensive cars. Disenchanted with their US record company, Capitol Records, Pink Floyd and O'Rourke negotiated a new contract with Columbia Records, who gave them a reported advance of $1,000,000 (US$5,080,297 in 2018 dollars). In Europe, they continued to be represented by Harvest Records. Despite the lack of creative direction, Waters began to visualise a new concept after several weeks. 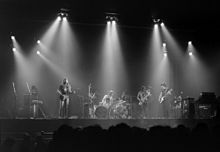 During 1974, Pink Floyd had sketched out three original compositions and had performed them at a series of concerts in Europe. These compositions became the starting point for a new album whose opening four-note guitar phrase, composed purely by chance by Gilmour, reminded Waters of Barrett. The songs provided a fitting summary of the rise and fall of their former bandmate. Waters commented: "Because I wanted to get as close as possible to what I felt ... [that] indefinable, inevitable melancholy about the disappearance of Syd." While Pink Floyd were working on the album, Barrett made an impromptu visit to the studio. Thorgerson recalled that he "sat round and talked for a bit, but he wasn't really there". He had changed significantly in appearance, so much so that the band did not initially recognise him. Waters was reportedly deeply upset by the experience. [nb 24] Most of Wish You Were Here premiered on 5 July 1975, at an open-air music festival at Knebworth. Released in September, it reached number one in both the UK and the US. The division of royalties was a source of conflict between band members, who earned royalties on a per-song basis. Although Gilmour was largely responsible for "Dogs", which took up almost the entire first side of the album, he received less than Waters, who contributed the much shorter two-part "Pigs on the Wing". Wright commented: "It was partly my fault because I didn't push my material ... but Dave did have something to offer, and only managed to get a couple of things on there." Mason recalled: "Roger was in full flow with the ideas, but he was really keeping Dave down, and frustrating him deliberately. "[nb 27] Gilmour, distracted by the birth of his first child, contributed little else toward the album. Similarly, neither Mason nor Wright contributed much toward Animals; Wright had marital problems, and his relationship with Waters was also suffering. Animals is the first Pink Floyd album that does not include a writing credit for Wright, who commented: "Animals ... wasn't a fun record to make ... this was when Roger really started to believe that he was the sole writer for the band ... that it was only because of him that [we] were still going ... when he started to develop his ego trips, the person he would have his conflicts with would be me." Released in January 1977, the album peaked on the UK chart at number two, and the US chart at number three. NME described the album as "one of the most extreme, relentless, harrowing and downright iconoclastic hunks of music", and Melody Maker's Karl Dallas called it "[an] uncomfortable taste of reality in a medium that has become in recent years, increasingly soporific". The album was supported by "Another Brick in the Wall (Part II)", which topped the charts in the US and the UK; it was Pink Floyd's first single since "Money". The Wall was released on 30 November 1979 and topped the Billboard chart in the US for fifteen weeks, reaching number three in the UK. The Wall ranks number three on the RIAA's list of the all-time Top 100 albums, with 23 million certified units sold in the US. The cover, with a stark brick wall and band name, was the first Pink Floyd album cover since The Piper at the Gates of Dawn not designed by Hipgnosis. Gerald Scarfe produced a series of animations for the subsequent live shows, The Wall Tour. He also commissioned the construction of large inflatable puppets representing characters from the storyline including the "Mother", the "Ex-wife" and the "Schoolmaster". Pink Floyd used the puppets during their performances of the album. Relationships within the band were at an all-time low; their four Winnebagos parked in a circle, the doors facing away from the centre. Waters used his own vehicle to arrive at the venue and stayed in different hotels from the rest of the band. Wright returned as a paid musician and was the only one of the four to profit from the venture, which lost about $600,000 (US$1,653,514 in 2018 dollars). Gilmour recorded his second solo album, About Face, in 1984, and used it to express his feelings about a variety of topics, from the murder of John Lennon to his relationship with Waters. He later stated that he used the album to distance himself from Pink Floyd. Soon afterwards, Waters began touring his first solo album, The Pros and Cons of Hitch Hiking. Wright formed Zee with Dave Harris and recorded Identity, which went almost unnoticed upon its release. [nb 39] Mason released his second solo album, Profiles, in August 1985. Following the release of The Pros and Cons of Hitch Hiking, Waters publicly insisted that Pink Floyd would not reunite. He contacted O'Rourke to discuss settling future royalty payments. O'Rourke felt obliged to inform Mason and Gilmour, which angered Waters, who wanted to dismiss him as the band's manager. He terminated his management contract with O'Rourke and employed Peter Rudge to manage his affairs. [nb 40] Waters wrote to EMI and Columbia announcing he had left the band, and asked them to release him from his contractual obligations. Gilmour believed that Waters left to hasten the demise of Pink Floyd. Waters later stated that, by not making new albums, Pink Floyd would be in breach of contract—which would suggest that royalty payments would be suspended—and that the other band members had forced him from the group by threatening to sue him. He then went to the High Court in an effort to dissolve the band and prevent the use of the Pink Floyd name, declaring Pink Floyd "a spent force creatively." When his lawyers discovered that the partnership had never been formally confirmed, Waters returned to the High Court in an attempt to obtain a veto over further use of the band's name. Gilmour responded by issuing a carefully worded press release affirming that Pink Floyd would continue to exist. He later told The Sunday Times: "Roger is a dog in the manger and I'm going to fight him." In 2013, Waters said he had failed to appreciate that the Pink Floyd name had commercial value independent of the band members, and was wrong to have attempted to stop the others using it. A Momentary Lapse of Reason was released in September 1987. Storm Thorgerson, whose creative input was absent from The Wall and The Final Cut, designed the album cover. To drive home that Waters had left the band, they included a group photograph on the inside cover, the first since Meddle. [nb 44] The album went straight to number three in the UK and the US. Waters commented: "I think it's facile, but a quite clever forgery ... The songs are poor in general ... [and] Gilmour's lyrics are third-rate." Although Gilmour initially viewed the album as a return to the band's top form, Wright disagreed, stating: "Roger's criticisms are fair. It's not a band album at all." Q Magazine described the album as essentially a Gilmour solo album. Waters attempted to subvert the Momentary Lapse of Reason tour by contacting promoters in the US and threatening to sue them if they used the Pink Floyd name. Gilmour and Mason funded the start-up costs with Mason using his Ferrari 250 GTO as collateral. Early rehearsals for the upcoming tour were chaotic, with Mason and Wright entirely out of practice. Realising he had taken on too much work, Gilmour asked Ezrin to assist them. As Pink Floyd toured North America, Waters' Radio K.A.O.S. tour was on occasion, close by, though in much smaller venues than those hosting his former band's performances. Waters issued a writ for copyright fees for the band's use of the flying pig. Pink Floyd responded by attaching a large set of male genitalia to its underside to distinguish it from Waters' design. The parties reached a legal agreement on 23 December; Mason and Gilmour retained the right to use the Pink Floyd name in perpetuity and Waters received exclusive rights to, among other things, The Wall. 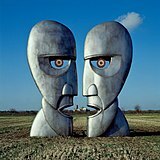 The album artwork for The Division Bell, designed by Storm Thorgerson, was intended to represent the absence of Barrett and Waters from the band. Waters (right) rejoined his former bandmates at Live 8. On 2 July 2005, Waters, Gilmour, Mason and Wright performed together as Pink Floyd for the first time in more than 24 years, at the Live 8 concert in Hyde Park, London. The reunion was arranged by Live 8 organiser Bob Geldof; after Gilmour declined the offer, Geldof asked Mason, who contacted Waters. About two weeks later, Waters called Gilmour, their first conversation in two years, and the next day Gilmour agreed. In a statement to the press, the band stressed the unimportance of their problems in the context of the Live 8 event. They planned their setlist at the Connaught Hotel in London, followed by three days of rehearsals at Black Island Studios. The sessions were problematic, with disagreements over the style and pace of the songs they were practising; the running order was decided on the eve of the event. At the beginning of their performance of "Wish You Were Here", Waters told the audience: "[It is] quite emotional, standing up here with these three guys after all these years, standing to be counted with the rest of you ... we're doing this for everyone who's not here, and particularly of course for Syd." At the end, Gilmour thanked the audience and started to walk off the stage. Waters called him back, and the band shared a group hug. Images of the hug were a favourite among Sunday newspapers after Live 8. [nb 49] Waters said of their almost 20 years of animosity: "I don't think any of us came out of the years from 1985 with any credit ... It was a bad, negative time, and I regret my part in that negativity." Barrett died on 7 July 2006, at his home in Cambridge, aged 60. His funeral was held at Cambridge Crematorium on 18 July 2006; no Pink Floyd members attended. Wright commented: "The band are very naturally upset and sad to hear of Syd Barrett's death. Syd was the guiding light of the early band line-up and leaves a legacy which continues to inspire." Although Barrett had faded into obscurity over the previous 35 years, the national press praised him for his contributions to music. [nb 51] On 10 May 2007, Waters, Gilmour, Wright and Mason performed at the Barrett tribute concert "Madcap's Last Laugh" at the Barbican Centre in London. Gilmour, Wright and Mason performed the Barrett compositions, "Bike" and "Arnold Layne", and Waters performed a solo version of his song "Flickering Flame". Wright died of an undisclosed form of cancer on 15 September 2008, aged 65. His former bandmates paid tributes to his life and work; Gilmour said: "In the welter of arguments about who or what was Pink Floyd, Rick's enormous input was frequently forgotten. He was gentle, unassuming and private but his soulful voice and playing were vital, magical components of our most recognised Pink Floyd sound." A week after Wright's death, Gilmour performed "Remember a Day" from A Saucerful of Secrets, written and originally sung by Wright, in tribute to him. Keyboardist Keith Emerson released a statement praising Wright as the "backbone" of Pink Floyd. On 26 September 2011, Pink Floyd and EMI launched an exhaustive re-release campaign under the title Why Pink Floyd ... ?, reissuing the band's back catalogue in newly remastered versions, including "Experience" and "Immersion" multi-disc multi-format editions. The albums were remastered by James Guthrie, co-producer of The Wall. In November 2015, Pink Floyd released a limited edition EP, 1965: Their First Recordings, comprising six songs recorded prior to The Piper at the Gates of Dawn. 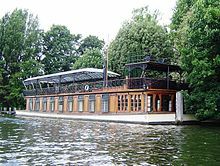 The Endless River was released on 7 November 2014, the second Pink Floyd album distributed by Parlophone following the release of the 20th anniversary editions of The Division Bell earlier in 2014. Though it received mixed reviews, it became the most pre-ordered album of all time on Amazon UK, and debuted at number one in several countries. The vinyl edition was the fastest-selling UK vinyl release of 2014 and the fastest-selling since 1997. In November 2016, Pink Floyd released a boxset, The Early Years 1965–1972, comprising outtakes, live recordings, remixes, and films from their early career. In 2018, Mason formed a new band, Nick Mason's Saucerful of Secrets, to perform Pink Floyd's early material. The band includes Gary Kemp of Spandau Ballet and longtime Pink Floyd collaborator Guy Pratt. They toured Europe in September 2018. In 1968, Wright commented on Pink Floyd's sonic reputation: "It's hard to see why we were cast as the first British psychedelic group. We never saw ourselves that way ... we realised that we were, after all, only playing for fun ... tied to no particular form of music, we could do whatever we wanted ... the emphasis ... [is] firmly on spontaneity and improvisation." Waters gave a less enthusiastic assessment of the band's early sound: "There wasn't anything 'grand' about it. We were laughable. We were useless. We couldn't play at all so we had to do something stupid and 'experimental' ... Syd was a genius, but I wouldn't want to go back to playing "Interstellar Overdrive" for hours and hours." Unconstrained by conventional pop formats, Pink Floyd were innovators of progressive rock during the 1970s and ambient music during the 1980s. Rolling Stone critic Alan di Perna praised Gilmour's guitar work as an integral to Pink Floyd's sound, and described him as the most important guitarist of the 1970s, "the missing link between Hendrix and Van Halen". Rolling Stone ranked Gilmour number 14 in their list of "100 Greatest Guitarists of All Time". In 2006, Gilmour said of his technique: "[My] fingers make a distinctive sound ... [they] aren't very fast, but I think I am instantly recognisable ... The way I play melodies is connected to things like Hank Marvin and the Shadows". Gilmour's ability to use fewer notes than most to express himself without sacrificing strength or beauty drew a favourable comparison to jazz trumpeter Miles Davis. In 2006, Guitar World writer Jimmy Brown described Gilmour's guitar style as "characterised by simple, huge-sounding riffs; gutsy, well-paced solos; and rich, ambient chordal textures." According to Brown, Gilmour's solos on "Money", "Time" and "Comfortably Numb" "cut through the mix like a laser beam through fog." Brown described the "Time" solo as "a masterpiece of phrasing and motivic development ... Gilmour paces himself throughout and builds upon his initial idea by leaping into the upper register with gut-wrenching one-and-one-half-step 'over bends', soulful triplet arpeggios and a typically impeccable bar vibrato." Brown described Gilmour's phrasing as intuitive, singling it out as perhaps his best asset as a lead guitarist. Gilmour explained how he achieved his signature tone: "I usually use a fuzz box, a delay and a bright EQ setting ... [to get] singing sustain ... you need to play loud—at or near the feedback threshold. It's just so much more fun to play ... when bent notes slice right through you like a razor blade." Waters experimented with the EMS Synthi A and VCS 3 synthesisers on Pink Floyd pieces such as "On the Run", "Welcome to the Machine", and "In the Flesh?". He used a Binson Echorec 2 delay effect on his bass-guitar track for "One of These Days". Pink Floyd also composed several film scores, starting in 1968, with The Committee. In 1969, they recorded the score for Barbet Schroeder's film More. The soundtrack proved beneficial: not only did it pay well but, along with A Saucerful of Secrets, the material they created became part of their live shows for some time thereafter. While composing the soundtrack for director Michelangelo Antonioni's film Zabriskie Point, the band stayed at a luxury hotel in Rome for almost a month. Waters claimed that, without Antonioni's constant changes to the music, they would have completed the work in less than a week. Eventually he used only three of their recordings. One of the pieces turned down by Antonioni, called "The Violent Sequence", later became "Us and Them", included on 1973's The Dark Side of the Moon. In 1971, the band again worked with Schroeder on the film La Vallée, for which they released a soundtrack album called Obscured by Clouds. They composed the material in about a week at the Château d'Hérouville near Paris, and upon its release, it became Pink Floyd's first album to break into the top 50 on the US Billboard chart. Regarded as pioneers of live music performance and renowned for their lavish stage shows, Pink Floyd also set high standards in sound quality, making use of innovative sound effects and quadraphonic speaker systems. From their earliest days, they employed visual effects to accompany their psychedelic rock music while performing at venues such as the UFO Club in London. Their slide-and-light show was one of the first in British rock, and it helped them become popular among London's underground. Absence as a lyrical theme is common in the music of Pink Floyd. Examples include the absence of Barrett after 1968, and that of Waters' father, who died during the Second World War. Waters' lyrics also explored unrealised political goals and unsuccessful endeavours. Their film score, Obscured by Clouds, dealt with the loss of youthful exuberance that sometimes comes with ageing. Longtime Pink Floyd album cover designer, Storm Thorgerson, described the lyrics of Wish You Were Here: "The idea of presence withheld, of the ways that people pretend to be present while their minds are really elsewhere, and the devices and motivations employed psychologically by people to suppress the full force of their presence, eventually boiled down to a single theme, absence: The absence of a person, the absence of a feeling. "[nb 56] Waters commented: "it's about none of us really being there ... [it] should have been called Wish We Were Here". "When I say, 'I'll see you on the dark side of the moon' ... what I mean [is] ... If you feel that you're the only one ... that you seem crazy [because] you think everything is crazy, you're not alone." 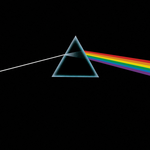 O'Neill Surber compared the lyrics of Dark Side of the Moon's "Brain Damage" with Karl Marx's theory of self-alienation; "there's someone in my head, but it's not me. "[nb 58] The lyrics to Wish You Were Here's "Welcome to the Machine" suggest what Marx called the alienation of the thing; the song's protagonist preoccupied with material possessions to the point that he becomes estranged from himself and others. Allusions to the alienation of man's species being can be found in Animals; the "Dog" reduced to living instinctively as a non-human. The "Dogs" become alienated from themselves to the extent that they justify their lack of integrity as a "necessary and defensible" position in "a cutthroat world with no room for empathy or moral principle" wrote Detmer. Alienation from others is a consistent theme in the lyrics of Pink Floyd, and it is a core element of The Wall. Pink Floyd has influenced numerous artists. David Bowie called Barrett a significant inspiration, and The Edge of U2 bought his first delay pedal after hearing the opening guitar chords to "Dogs" from Animals. Other bands and artists who cite them as an influence include Queen, Tool, Radiohead, Steven Wilson, Kraftwerk, Marillion, Queensrÿche, Nine Inch Nails, the Orb and the Smashing Pumpkins. Pink Floyd were an influence on the neo-progressive rock subgenre which emerged in the 1980s. The English rock band Mostly Autumn "fuse the music of Genesis and Pink Floyd" in their sound. Pink Floyd were admirers of the Monty Python comedy group, and helped finance their 1975 film Monty Python and the Holy Grail. In May 2017, to mark the 50th anniversary of Pink Floyd's first single, an audio-visual exhibition, Their Mortal Remains, opened at the Victoria and Albert Museum in London. The exhibition featured analysis of cover art, conceptual props from the stage shows, and photographs from Mason's personal archive. It was extended for two weeks beyond its planned closing date of 1 October. ^ The four-song session became the band's first demo and included the R&B classic "I'm a King Bee" (original of bluesman Slime Harpo, and three Syd Barrett originals, "Butterfly", "Lucy Leave" and "Double O Bo", a song Mason described as "Bo Diddley meets the 007 theme". ^ In late 1967, Barrett suggested adding four new members; in the words of Waters: "two freaks he'd met somewhere. One of them played the banjo, the other the saxophone ... [and] a couple of chick singers". ^ In 1976, Pink Floyd had become involved with financial advisers Norton Warburg Group (NWG). NWG became the band's collecting agents and handled all financial planning, for an annual fee of about £300,000 (equivalent to £1,690,500 in 2018). NWG invested between £1.6 million and £3.3 million of the band's money in high-risk venture capital schemes, primarily to reduce their exposure to UK taxes. It soon became apparent that the band were still losing money. Not only did NWG invest in failing businesses, they also left the band liable for tax bills as high as 83 per cent of their income. The band eventually terminated their relationship with NWG and demanded the return of any funds not yet invested, which at that time amounted to £860,000; they received only £740,000. Pink Floyd eventually sued NWG for £1M, accusing them of fraud and negligence. NWG collapsed in 1981: Andrew Warburg fled to Spain; Waterbrook purchased Norton Warburg Investments, and many of its holdings sold at a significant loss. Andrew Warburg began serving a three-year jail sentence upon his return to the UK in 1987. ^ In 2006, Gilmour began a tour of small concert venues with contributions from Wright and other musicians from the post-Waters Pink Floyd tours. Gilmour, Wright, and Mason's encore performance of "Wish You Were Here" and "Comfortably Numb" marked the only appearance by Pink Floyd since Live 8 as of 2012[update]. ^ Mason 2005, pp. 112–114, 127–131: On O'Rourke becoming the band's manager. ^ "AC/DC's 'Back In Black' at 35: Classic Track-by-Track Album Review". ^ "RIAA's Top 100 Albums". Recording Industry Association of America. Retrieved 21 August 2012. ^ Mason 2005, p. 330: Momentary Lapse of Reason tour crew was almost identical to the Division Bell tour crew; Povey 2008, p. 270: Rehearsing for over two weeks at Norton Air Force Base before opening in Miami. ^ Kielty, Martin (7 January 2013). "Pink Floyd was over in 1985 says Waters". Classic Rock Magazine. Archived from the original on 3 December 2013. ; "Pink Floyd star: Reunion unlikely". Toronto Sun. wenn.com. 28 September 2011. Retrieved 1 December 2013. ^ "David Gilmour Performs Pink Floyd's "Remember a Day" in Tribute to Rick Wright" (Video). 2015-09-15. Retrieved 2016-08-03. ^ "Official Keith Emerson Website – Richard Wright Tribute by Keith Emerson". www.keithemerson.com. Retrieved 2016-08-03. ^ "The Endless River: Amazon.co.uk: Music". Amazon.co.uk. Retrieved 22 September 2014. ^ "Pink Floyd score first Number 1 album in nearly 20 years!". localuknews.co.uk. 17 November 2014. Archived from the original on 25 December 2014. Retrieved 17 November 2014. ^ Music, Guardian (14 August 2015). "Pink Floyd are 'done', says Dave Gilmour". The Guardian. ^ Mazza, Ed (30 May 2018). "Pink Floyd Co-Founder Forms New Act To Play The Band's Earliest Songs". HuffPost UK. Retrieved 30 May 2018. ^ Kielty, Martin. "Nick Mason's Pink Floyd Supergroup Announces Debut Tour". Ultimate Classic Rock. Retrieved 30 May 2018. ^ a b di Perna 2006, p. 58: "the missing link"; For Rolling Stone's "100 Greatest Guitarists" list see: "100 Greatest Guitarists of All Time: 51) David Gilmour". Rolling Stone. Retrieved 2 August 2012. ^ For 250 million records sold see: "Pink Floyd Reunion Tops Fans' Wish List in Music Choice Survey". Bloomberg Television. 26 September 2007. Archived from the original on 12 August 2013. Retrieved 2 August 2012. ; For 75 million RIAA-certified units sold see: "Top Selling Artists". Recording Industry Association of America. Retrieved 2 August 2012. ; For 37.9 million albums sold since 1993 see: "The Nielsen Company & Billboard's 2012 Music Industry Report". Business Wire. 4 January 2013. Retrieved 10 May 2014. ^ "100 Greatest Artists: 51) Pink Floyd". Rolling Stone. 2010-12-03. Retrieved 2 August 2012. ^ Barnes, Anthony (3 October 2004). "Q: Which is biggest band of all time? A: And readers say ..." The Independent. London. Retrieved 2 August 2012. ^ "And the Winners Are ..." The New York Times. 2 March 1995. Retrieved 2 August 2012. ^ For Queen citing Pink Floyd as an influence see: Sutcillfe, Phil (2009). Queen: The Ultimate Illustrated History of the Crown Kings of Rock. Voyageur Press. p. 17. ISBN 978-0-7603-3719-6. ; For Kraftwerk see: Queenan, Joe (22 February 2008). "Vorsprung durch Techno". The Guardian. Retrieved 31 August 2012. ; For Marillion see: Thore, Kim (27 August 2009). "Steve Rothery Interview". All Access Magazine. Archived from the original on 25 March 2014. Retrieved 24 March 2014. ; For Tool see: The 50 Greatest Bands. Spin. February 2002. p. 78. Retrieved 31 August 2012. ; Manning 2006, p. 288: Queensryche, the Orb, Nemrud, the Smashing Pumpkins; 289: Radiohead; Kitts & Tolinski 2002, p. 126: For Nine Inch Nails see the back cover; For Steven Wilson, see: Masters, Tim (6 September 2012). "Genesis honoured at Progressive Music awards". BBC News. BBC. Retrieved 30 December 2017. ^ "Pink Floyd exhibition announced for Victoria and Albert Museum". BBC News. 31 August 2016. Retrieved 1 October 2017. ^ "V&A – Pink Floyd: Their Mortal Remains". Victoria and Albert Museum. Retrieved 7 October 2017. ^ "Ambitious, fascinating and faceless – just like Pink Floyd themselves: Their Mortal Remains, V&A, review". The Daily Telegraph. 7 May 2018. Retrieved 7 October 2017. ^ "Pink Floyd exhibition set to become V&A's most visited music show". The Guardian. 30 August 2017. Retrieved 7 October 2017. Simmons, Sylvie (December 1999). "Pink Floyd: The Making of The Wall". Mojo Magazine. 73.